Believe it or not, being married to a Korean husband is no simple task, and it’s not just about eating Kimchi everyday and learning how to write Korean with correct spacing between the words. What I am referring to is this: whenever I see my in-law family members in Korea, I must remember to call each one of them by their appropriate titles and not by their names. Unlike in Canada where I would be calling my in-law families by their given names, in Korea, a complex system of family titles exists, where each family member receives a formal title depending on the nature of his or her relationship to my spouse. For example, when referring to my husband’s younger brother, I have to call him “도련님” if he is unmarried, or “서방님” if he is married. However, when referring to my husband’s older brother, he receives the title of “시아주버님” regardless of his marital status. Likewise, I have to call my husband’s younger sister “아가씨,” whereas his older sister is called “형님.” For someone who is used to hearing “brother in-law, sister in-law” regardless of the person’s age or marital status, trying to remember these different family titles has surely been a daunting task. To help you get a grasp of how difficult this task really is, let me introduce to you to some of the common family titles that are used in Korea – and there are lots of them! 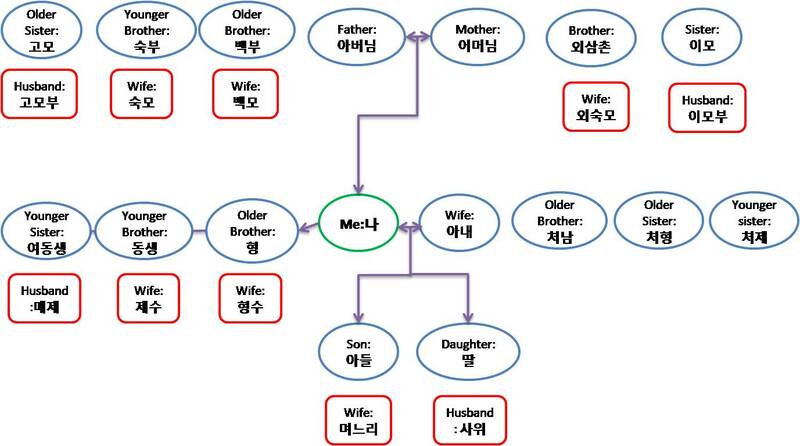 Below is a family tree depicting a hypothetical list of family members, with their Korean titles (in bold) as perceived by “Me.” Pay particular attention to the different titles for the spouses of your siblings, and also to the siblings of your wife; differentiation by age is very important in Korean society. Here is a quick question: what happens if you call your wife’s older brother by his name and not by his given title? Or even worse, what happens if you, by mistake, call your older brother’s wife by her name and not by her given title? The answer is you will be seen as being bad-mannered, disrespectful, or even worse, ill-bred by your siblings, their spouse, and your parents in-law. Why? The reason lies in the Korean society’s deep historical connection with Confucianism. In Confucianism, relationship between peoples has a more hierarchical structure where age, relationships, and positions in society play a crucial role in determining the person’s relative position in the hierarchy. Thus, to match this emphasis on hierarchical relationships, titles instead of names are used as ways of showing respect and expressing signs of recognition for each other. To explain, consider this comparison: In Canada, we refer to our parents as “father” and “mother,” because it is inappropriate to call them by their names. In Korea, this practice is extended further to include older brother, older sister, their spouse, parents’ siblings, and particularly, the in-law families. As such, if you forget to call them by their appropriate titles, it is natural to assume that you are bad-mannered and disrespectful. In conclusion, learning about Korea has some of its unique challenges, and it is not just about learning how to eat Kimchi everyday and write Korean with correct spacing between the words. So, if you are planning to marry a Korean person, or if you are already married to one, I highly recommend that you memorize these Korean family titles as soon as you can before you meet your in-laws for the first time. But let me assure you, even native Koreans have a hard time remembering these titles and when they make a mistake, they are guaranteed to face harsher criticism than what you would ever face from your in-law families. So don’t fret, because you are not alone facing in this challenge – all Koreans are with you. Wow… I’ve always wanted a Korean husband, but this family title thing is a lot to take in! Have you actually memorized all these titles?